Carn nan Gobhar has the general shape of a triangular pyramid. A SSE ridge leads down to Mullach na Moille then turns ESE towards the access path by the Allt Mullardoch to Glen Cannich. The WNW ridge links to Sgurr na Lapaich and the ENE ridge leads to Creag Dubh from where gentle N slopes give access to Glen Strathfarrar. 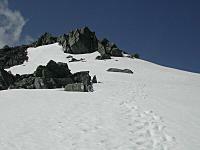 Generally easy to moderate slopes on the ridges, but some steep slopes on the flanks. 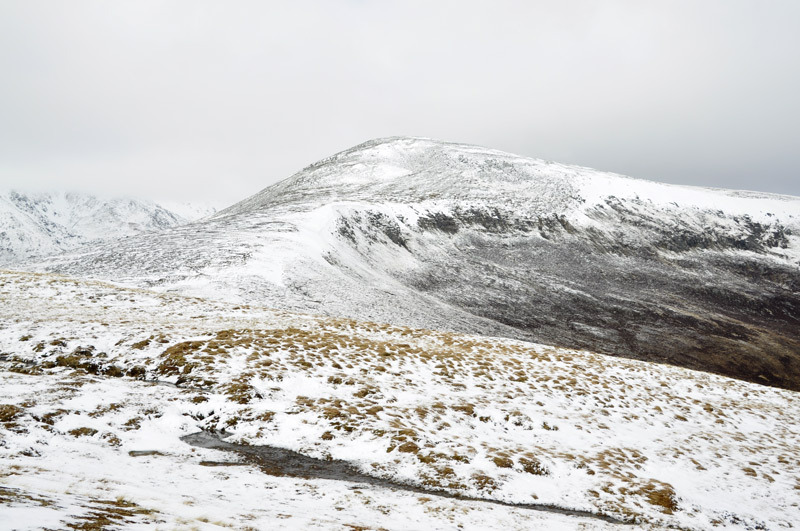 Carn nan Gobhar from Sgurr na Lapaich. 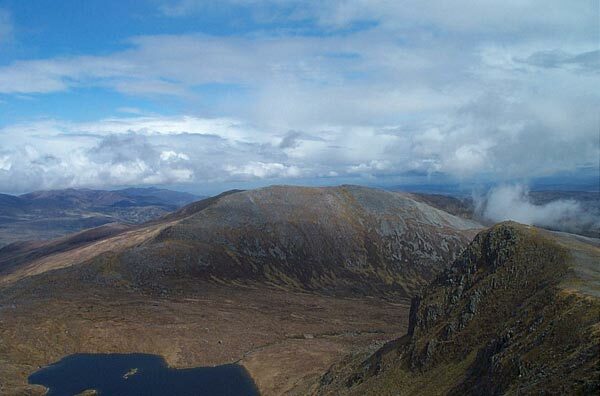 The summary information of one or more ascent routes that include Carn nan Gobhar [Loch Mullardoch]. 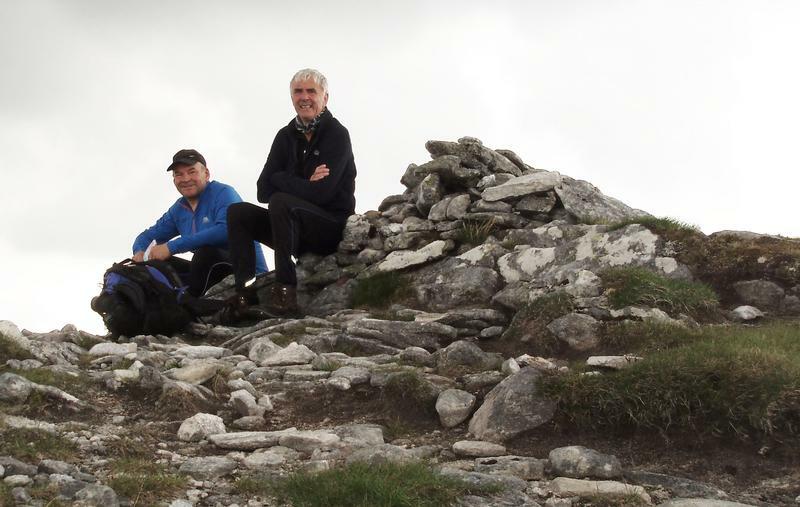 Roy and John at summit still not wearing waterproofs! 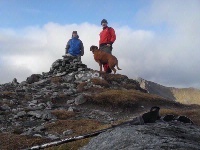 Karl and me with Oscar on summit, 5/11/11. 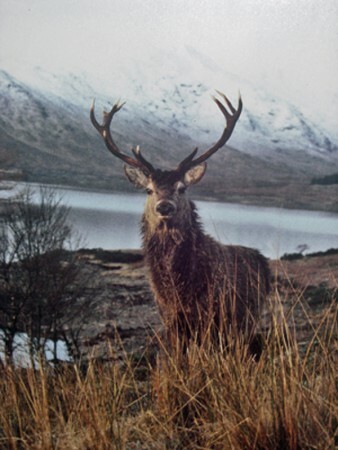 Post a few words about Carn nan Gobhar [Loch Mullardoch] or read what others have had to say. Would highly recommend boat up loch and do route of 4 Munros clockwise, we went the other way round and is 14k from An Socach back to dam, path along side of Loch is hellish and badly undercut / fallen away on steep slopes and could be dangerous, and ruined good day out, took 13.5 hrs to complete circuit 3 of which spent on track along Loch, 1 river crossing required when dam comes into view, easly managed just above high water mark, otherwise good bridges over other water courses. 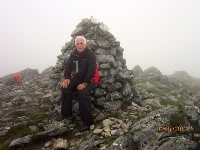 2 day hike covering the 9 surrounding munros of Loch Mullardoch over a distance of approx 45km. 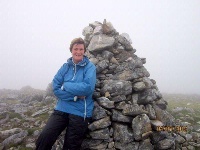 Day 1 started with gentle climb up Carn nan Gobhars grassy slopes in low cloud and made navigation a bit more tricky coming off Lapaich and Riabhachan. After descending An Socach we headed west to river crossing and camped at foot of Beinn Fhionnlaidh among hungry midges. Day 2 required long slog up Fhionnlaidh but once on ridge it was a long but enjoyable walk with only intermittent cloud cover. Long 2 days but wonderful sense of isolation. Definitely worth another visit in better weather. Park just before Dam, and follow initial good vehicle track which gives way to peaty agrocat route(higher route on OS) to bridge over Allt Mullardoch. Ascend heathery SE ridge of Mullach na Maoile, ground improves to easy walking on ridge to final stony pull up to large cairn, the actual summit is 200m further on.